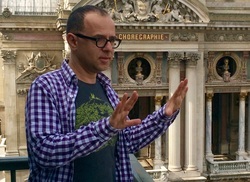 Hervé Cohen, Filmmaker, Cinematographer, Editor. Life Underground nominated for Best Short Form Series at IDA - International Documentary Association, Los Angeles. Lincoln Center, New York, on July 21st 2018. AYITI MON AMOUR received Best Cinematography Award at Pachuca International Film Festival, Mexico! AND is the official Haiti's entry for Best Foreign-Language Film at the Oscars 2018! ﻿﻿Hervé Cohen has always been fascinated with capturing the essence of the human experience. A native of Paris, France, Hervé Cohen is an award-winning 20-year veteran in the documentary film industry. His most acclaimed documentaries have taken him to various parts of the world; from the Casamance in Senegal, where he filmed the initiation ceremony of the young Diolas (Sikambano, the sons of the Sacred Woods), to the countryside of Sichuan, China, to follow the work of three traveling projectionists (Electric Shadows). His films have been aired on television networks around the world and showcased at numerous prestigious festivals. Hervé Cohen is producer, co-director and videographer of the critically acclaimed documentary Closer to the Dream which chronicles Barack Obama's historical campaign through the stories of ordinary individuals around the country from across racial and party lines. A version for French public television was aired in August of 2008 and scored the highest ratings of the year and received rave reviews from the press. The feature-length version of the film has been released on DVD in February 2010. Mr. Cohen is currently production his upcoming project Life Underground, a feature length essay-like documentary film about the connected lives of subway riders in various parts of the world, for which he was awarded a writer’s grant from “La Société des Auteurs” (Writer’s Guild) and the National Center for Cinema in France. This project is endorsed and fiscally sponsored by the San Francisco Film Society. Life Underground, a meditation on the life elements that bind us all in the era of globalization, is also a transmedia project and is currently developed as an interactive web documentary. Since spring 2003, Mr. Cohen has been working as field producer and cinematographer on the award-winning Wide Angle series for PBS, Time for School. The unprecedented series is a 12-year documentary project that visits seven classrooms in seven countries to offer a glimpse into the lives of seven extraordinary children who are struggling to get a basic education. Directed and shot the Benin segments (2003, 2006, 2009, 2015) and the India segment in 2006. Also for Wide Angle in coproduction with France 2, in 2004, Hervé was the field producer and cinematographer for Young, Muslim and French. Mr. Cohen’s body of documentary works is made of 13 films of various lengths exploring a variety of socially engaging themes such as identity, exile, gentrification, ancestral traditions, cinema and art. Whether he is making films about others or his own family history, his work is always intimate and personal. Capturing our common humanities on film, whether we live in a remote village in Senegal or in urban Marseille, is what motivates Hervé Cohen as a filmmaker. Une Autre Vie (Another Life) his most personal and intimate film thus far, is a one-hour documentary film about the history and the exile of the Algerian Jews in France told by Mr. Cohen's own family. It received raving reviews when it aired on "Planète", European Documentary channel. Une Autre Vie was deeply inspired by Mr. Cohen’s experience while living in New York, when he worked as videographer for the Steven Spielsberg’s Shoah Visual History Foundation, filming testimonies of the survivors of the Holocaust. 10 years later, Hervé reproduced this experience in collaboration with the Centre Darius Milhaud (Aix-en-Provence, France), by creating the project Ateliers de la Mémoire (The Memory Workshop), to capture the life stories of the eroding generation of Sephardi Jews in the South of France. In the fall of 2009 Hervé Cohen traveled to Paris, France to work as cinematographer on his first feature length experience using the Red camera. The film is the latest project from Renaud Cohen (his brother) entitled In case I don’t get the Golden Palm, an award-winning independently produced French comedy. In the summer 2012, Hervé Cohen worked as director of photography on a second feature-length narrative by award-wining French scriptwriter/director Jean-Louis Milesi, titled Don't Give Up the Ghost, shot in the Bay Area. He shot another feature-length narrative in 2015, Ayiti Mon Amour, shot in Haiti and directed by Guetty Felin, selected at major international film festivals. Mr. Cohen’s films have been showcased and have won prizes at various festivals around the world: Special mention at the Jean Rouch Festival in Paris Sikambano, the Sons of the Sacred Woods also selected by the Margaret Mead Film Festival in New York and Festival dei Popoli in Florence, Italy. First prize in: Oberhausen Film Festival, Leipzig Film Festival, Germany, Estonian Film Festival, and Montecatini in Italy, for Electric Shadows. Also shown in Festival du Réel in Paris, Rio de Janeiro Film Festival, Sydney film festival, Margaret Mead, etc. Writer's grants from: The National Center for Cinema (CNC), France for Electric Shadows and Under the threat of Vesuvius and Life Underground, and from “La Société des Auteurs”(Writer’s Guild), France for Life Underground. Herve Cohen earned his Bachelor’s, Master’s of law and Juris Doctorate in Audiovisual Law from Panthéon-Sorbonne in Paris, France. He is also a graduate in the cinematography section of the Ecole Nationale Supérieure Louis Lumière.